Royal Dutch Gazelle Bicycles didn’t invent the bicycle but they helped the Dutch become the cylce nation of the world. The brand is now the largest and most popular bicycle manufacturer in the Netherlands. Gazelle bikes have always been created for comfort, safety, sustainability and stylish design which is still done today. The company was founded in 1892 and was given the Royal title by Princess Margriet Francisca in 1992. Royal Dutch Gazelle Bicycles first started by importing bicycles from England and then selling them throughout the Netherlands. In 1902, the company began to produce their own bicycles using the Gazelle name. Royal Dutch Gazelle Bicycles has been an extremely popular and well known brand not only in the Netherlands but also throughout Europe. This has been proven by winning several awards including being voted the most trusted brand of bicycles throughout Europe by a European Readers Digest survey in 2010. It is estimated that Gazelle produces over 350,000 bicycles each year and has delivered over 14 million bikes since the company first opened. Although Gazelle bikes are still produced today, the company is now owned by Pon which is a Dutch bike manufacturer that produces other brands as well. Gazelle started to make large quantities of bicycles starting in the 1920’s that they sold in their home country the Netherlands but also exported to Indonesia where bikes were a significant form of transportation and were in high demand. In the early 1930’s, Gazelle introduced a collapsible and foldable bike that could be conveniently used by delivery riders. In 1935, they designed a tandem bike that focused on the comfort and safety of both riders and was very popular. Gazelle designed and introduced an electric power assisted bicycle in the late 1930’s and also patented the very first 3 speed bicycle with a shift system mounted on the handlebar grips in 1959. The company introduced another folding bike that they still manufacture and sell today. Gazelle bikes developed a special speed racing division in the 1960’s that reached the peak of its success in the 1980’s. Gazelle no longer builds racing bikes, although the parent company Pon also owns the Cervelo brand. Gazelle bikes used the popular comic character “Piet Pelle on His Gazelle” which was developed into an illustrated book that Gazelle bikes used for marketing and sales. Piet Pelle is a household name in the Netherlands and is part of Dutch pop culture history. The bikes are designed today with a vintage and classic look. Their models include recreational bikes that can tackle any terrain, city bikes designed for reliability and demanding use and electric bikes that are simple to operate and extremely efficient. The Royal Dutch Gazelle Bicycle company has won numerous awards with the bicycles and is proven market leader. 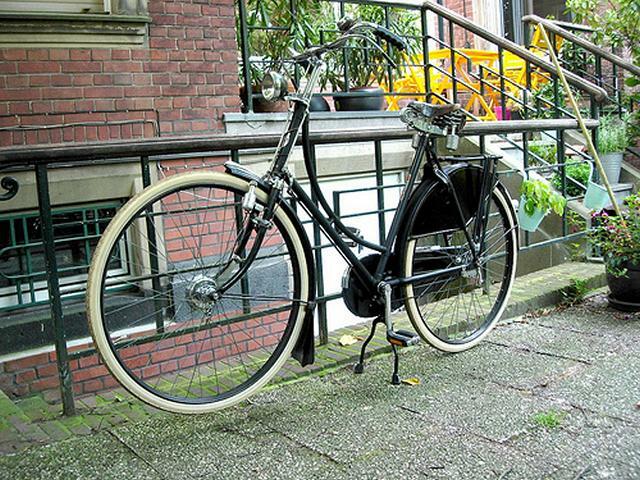 In Europe, when people think of Dutch bikes, what comes to mind will be most likely the Gazelle brand and their all black step through bikes. The company was one of the engines that helped the Dutch to become the cycling nation of the world.